Should economics, sociology or management count as science? 2500 years ago, Plato, in The Sophist, described a battle between the gods and the earth giants. The fight was over the foundations of knowledge. The gods thought knowledge came from innate concepts and deductive reasoning only. Euclid’s geometry was a perfect example – self-evident axioms plus deduced theorems. In this model, no experiments are needed. Plato explained that the earth giants, however, sought knowledge through earthly experience. Plato sided with the gods; and his opponents, the Sophists, sided with the giants. Roughly speaking, this battle corresponds to the modern tension between rationalism (the gods) and empiricism (the giants). For the gods, the articles of knowledge must be timeless, universal and certain. For the giants, knowledge is contingent, experiential, and merely probable. Plato’s approach led the Greeks – Aristotle, most notably – to hold that rocks fall with speeds proportional to their weights, a belief that persisted for 2000 years until Galileo and his insolent ilk had the gall to test it. Science was born. Enlightenment era physics aside, Plato and the gods are alive and well. Scientists and social reformers of the Enlightenment tried to secularize knowledge. They held that common folk could overturn beliefs with the right evidence. Empirical evidence, in their view, could trump any theory or authority. Math was good for deduction; but what’s good for math is not good for physics, government, and business management. Euclidean geometry was still regarded as true – a perfect example of knowledge fit for the gods – throughout the Enlightenment era. But cracks began to emerge in the 1800s through the work of mathematicians like Lobachevsky and Riemann. By considering alternatives to Euclid’s 5th postulate, which never quite seemed to fit with the rest, they invented other valid (internally consistent) geometries, incompatible with Euclid’s. On the surface, Euclid’s geometry seemed correct, by being consistent with our experience. I.e., angle sums of triangles seem to equal 180 degrees. But geometry, being pure and of the gods, should not need validation by experience, nor should it be capable of such validation. Non-Euclidean Geometry rocked Victorian society and entered the domain of philosophers, just as Special Relativity later did. Hotly debated, its impact on the teaching of geometry became the subject of an entire book by conservative mathematician and logician Charles Dodgson. Before writing that book, Dodgson published a more famous one, Alice in Wonderland. Humpty is right that one can redefine terms at will, provided a definition is given. But the exchange hints at a deeper notion. While having a private language is possible, it is also futile, if the purpose of language is communication. Another aspect of this exchange gets little coverage by analysts. Dodgson has Humpty emphasize the concept of argument (knock-down), nudging us in the direction of formal logic. Humpty is surely a stand-in for the proponents of non-Euclidean geometry, against whom Dodgson is strongly (though wrongly – more below) opposed. Dodgson was also versed in Greek philosophy and Platonic idealism. Humpty is firmly aligned with Plato and the gods. Alice sides with Plato’s earth giants, the sophists. Humpty’s question, which is to be master?, points strongly at the battle between the gods and the giants. Was this Dodgson’s main intent? When Alice first chases the rabbit down the hole, she says that she fell for a long time, and reasons that the hole must be either very deep or that she fell very slowly. Dodgson, schooled in Newtonian mechanics, knew, unlike the ancient Greeks, that all objects fall at the same speed. So the possibility that Alice fell slowly suggests that even the laws of nature are up for grabs. In science, we accept that new evidence might reverse what we think are the laws of nature, yielding a scientific revolution (paradigm shift). In trying to vindicate “Euclid’s masterpiece,” as Dodgson called it, he is trying to free himself from an unpleasant logical truth: within the realm of math, we have no basis to the think the world is Euclidean rather than Lobichevskian. He’s trying to rescue conservative mathematics (Euclidean geometry) by empirical means. Logicians would say Dodgson is confusing a synthetic and a posteriori proposition with one that is analytic and a priori. That is, justification of the 5th postulate can’t rely on human experience, observations, or measurements. Math and reasoning feed science; but science can’t help math at all. Dodgson should know better. In the battle between the gods and the earth giants, experience can only aid the giants, not the gods. As historian of science Steven Goldman put it, “the connection between the products of deductive reasoning and reality is not a logical connection.” If mathematical claims could be validated empirically then they wouldn’t be timeless, universal and certain. Dawid’s criteria may not apply to the social and dismal sciences. Far from the only game in town, too many theories – as untestable as strings, all plausible but mutually incompatible – vie for our Nobel honors. Privileging innate knowledge and reason – as Plato did – requires denying natural human skepticism. Believing that intuition alone is axiomatic for some types of knowledge of the world requires suppressing skepticism about theorems built on those axioms. Philosophers call this epistemic foundationalism. A behavioral economist might see it as confirmation bias and denialism. The Antipositivist school is serious about the issue Shearing joked about. Jurgen Habermas argues that sociology cannot explain by appeal to natural law. Deirdre (Donald) McCloskey mocked the empiricist leanings of Milton Friedman as being invalid in principle. Presumably, antipositivists are content that theories only explain, not predict. In business management, the co-occurence of the terms theory and practice and the usage of the string “theory and practice” as opposed to “theory and evidence” or “theory and testing” suggests that Plato reigns in management science. “Practice” seems to mean interacting with the world under the assumption that that the theory is true. The theory and practice model is missing the notion of testing those beliefs against the world or, more importantly, seeking cases in the world that conflict with the theory. Further, it has no notion of theory selection; theories do not compete for success. Can a research agenda with no concept of theory testing, falsification effort, or theory competition and theory choice be scientific? If so, it seems creationism and astrology should be called science. Several courts (e.g. McLean vs. Arkansas) have ruled against creationism on the grounds that its research program fails to reference natural law, is untestable by evidence, and is certain rather than tentative. Creationism isn’t concerned with details. Intelligent Design (old-earth creationism), for example, is far more concerned with showing Darwinism wrong that with establishing an age of the earth. There is no scholarly debate between old-earth and young-earth creationism on specifics. Critics say the fields of economists and business and business management are likewise free of scholarly debate. They seem to have similarly thin research agendas. Competition between theories in these fields is lacking; incompatible management theories coexist without challenges. Many theorist/practitioners seem happy to give priority to their model over reality. 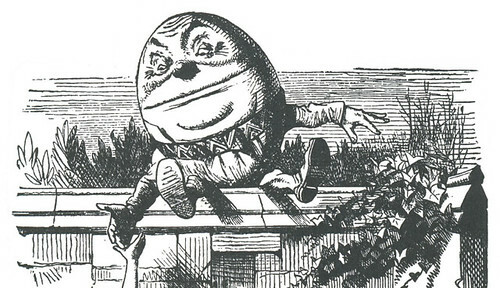 Humpty Dumpty had bold theories that he furiously proselytized. Happy to construct his own logical framework and dwell therein, free from empirical testing, his research agenda was as thin as his skin. Perhaps a Nobel Prize and a high post in a management consultancy are in order. Empiricism be damned, there’s glory for you. If management thinker Frederick Winslow Taylor (died 1915) were alive today he would certainly resent the straw man we have stood in his place. Taylor tried to inject science into the discipline of management. Innocent of much of the dehumanization of workers pinned on him, Taylor still failed in several big ways, even by the standards of his own time. For example, he failed at science. What Taylor called science was mostly mere measurement – no explanatory or predictive theories. And he certainly didn’t welcome criticism or court refutation. Not only did he turn workers into machines, he turned managers into machines that did little more than take measurements. And as Paul Zak notes in Trust Factor Taylor failed to recognize that organizations are people embedded in a culture. Taylor is long dead, but Taylorism is alive and well. Before I left Goodyear Aerospace in the late 80’s, I recall the head of Human Resources at a State of the Company address reporting trends in terms of “personnel units.” Did these units include androids and work animals I wondered. Heavy-handed management can turn any of Douglas McGregor’s Theory Y (internally motivated) workers into Theory X (lazy, needs to be prodded, extrinsic rewards) using tried and true industrial-era management methodologies. That is, one can turn TPS, the Toyota Production System, originally aimed at developing people, into just another demoralizing bureaucratic procedure wearing lipstick. In Silicon Valley, software creation is modeled as a manufacturing process. Scrum team members often have no authority for schedule, backlog, communications or anything else; and teams “do agile” with none of the self-direction, direct communications, or other principles laid out in the agile manifesto. Yet sprint velocity is computed to three decimal places by steady Taylorist hands. Across the country, micromanagement and Taylorism are two sides of the same coin, committed to eliminating employees’ control over their own futures and any sense of ownership in their work product. As Daniel Pink says in Drive, we are meant to be autonomous individuals, not individual automatons. This is particularly true for developers, who are inherently self-directed and intrinsically motivated. Scrum is allegedly based on Theory Y, but like Matrix Management a generation earlier, too many cases of Scrum are Theory X at core with a veneer of Theory Y. Management is utterly broken, especially at the lowest levels. It is shaped to fill two forgotten needs – the deskilling of labor, and communication within fragmented networks. Henry Ford is quoted as saying, “Why is it every time I ask for a pair of hands, they come with a brain attached?” Likely a misattribution derived from Wedgwood (below), the quote reflects generations of self-destructive management sentiment. The intentional de-skilling of the workforce accompanied industrialization in 18th century England. Division of labor yielded efficient operations on a large scale; and it reduced the risk of unwanted knowledge transfer. When pottery maker Josiah Wedgwood built his factory, he not only provided for segmentation of work by tool and process type. He also built separate entries to each factory segment, with walls to restrict communications between workers having different skills and knowledge. Wedgwood didn’t think his workers were brain-dead hands; but he would have preferred that they were. He worried that he might be empowering potential competitors. He was concerned that workers possessed drive and an innovative spirit, not that they lacked these qualities. Wedgwood pioneered intensive division of labor, isolating mixing, firing, painting and glazing. He ditched the apprentice-journeyman-master system for fear of spawning a rival, as actually became the case with employee John Voyez. Wedgwood wanted hands – skilled hands – without brains. “We have stepped beyond the other manufactur[er]s and we must be content to train up hands to suit our purpose” (Wedgwood to Bentley, Sep 7, 1769). When textile magnate Francis Lowell built factories including dormitories, chaperones, and access to culture and education, he was trying to compensate for the drudgery of long hours of repetitive work and low wages. When Lowell cut wages the young female workers went on strike, published magazines critical of Lowell (“… just as though we were so many living machines” – Ellen Collins, Lowell Offering, 1845) and petitioned Massachusetts for legislation to limit work hours. Lowell wanted hands but got brains, drive, and ingenuity. To respond to market dynamics and fluctuations in demand for product and in supply of raw materials, a business must have efficient and reliable communication channels. Commercial telephone networks only began to emerge in the late 1800s. Long distance calling was a luxury well into the 20th century. When the Swift Meat Packing Company pioneered the vertically integrated production system around 1915, G.F. Swift faced the then-unique challenge of needing to coordinate sales, supply chain, marketing, and operations people from coast to coast. He set up central administration and a hierarchical, military-style organizational structure for the same reason Julius Caesar’s army used that structure – to quickly move timely knowledge and instructions up, down, and laterally. So our management hierarchies address a long-extinct communication need and our command/control management methods reflect an industrial age wish for mindless carrot-stick employees – a model the industrialists themselves knew to be inaccurate. But we’ve made this wish come true; treat people badly long enough and they’ll conform to your Theory X expectations. Business schools tout best-practice management theories that have never been subjected to testing or disconfirmation. In their views, it is theory, and therefore it’s science. Much of modern management theory pretends that today’s knowledge workers are “so many living machines,” human resources, human capital, assets, and personnel units. Unlike in the industrial era, modern business has no reason to de-skill its labor, blue collar or white. Yet in many ways McKinsey and other management consultancies like them seem dedicated to propping up and fine tuning Theory X, as evidence to the priority of structure in the 7S, Weisbord, and Galbraith organizational models for example. This is an agency problem with a trillion dollar price tag. When asked which they would prefer, a company of self-motivated, self-organizing, creative problem solvers or flock of compliant drones, most CEOs would choose the former. Yet the systems we cultivate yield the latter. We’re managing 21st century organizations with 19th century tools. For almost all companies, a high-performing workforce is the most important source of competitive advantage. Most studies of employee performance, particularly white-collar knowledge workers, find performance to hinge on engagement and trust (level of trust in managers and the firm by employees). Engagement and trust are closely tied to intrinsic motivation, autonomy, and sense of purpose. That is, performance is maximized when they’re able to tap into their skills, knowledge, experience, creativity, discipline, passion, agility and internal motivation. Studies by Deloitte, Towers Watson, Gallup, Aon Hewitt, John P Kotter, and Beer and Eisenstat over the past 25 years reach the same conclusions. All this means Taylorism and embedding Theory X in organizational structure and management methodologies simply shackle the main source of high performance in most firms. As Pink says, command and control lead to compliance; autonomy leads to engagement. Peter Drucker fought for this point in the 1950s; America didn’t want to hear it. Frederick Taylor’s been dead for 100 years. Let’s let him rest in peace. Bill Storage is a scholar in the history of science and technology who in his corporate days survived encounters with strategic management initiatives including Quality Circles, Natural Work Groups, McKinsey consultation, CPIP, QFD, Leadership Councils, Kaizen, Process Based Management, and TQMS. While it’s been around for a century, the concept of positive risk has become popular only in the last few decades. Its popularity likely stems from enterprise risk management (ERM) frameworks that rely on Frank Knight’s (“Risk, Uncertainty & Profit,” 1921) idiosyncratic definition of risk. Knight equated risk with what he called “measurable uncertainty” – what most of us call probability – which he differentiated from “unmeasurable uncertainty,” which is what most of us call ignorance (not in the pejorative sense). Many ERM frameworks rely on Knight’s terminology, despite it being at odds with the risk language of insurance, science, medicine, and engineering – and everywhere else throughout modern history. Knight’s usage of terms conflicted with that of his more mathematically accomplished contemporaries including Ramsey, Kolmogorov, von Mises, and de Finetti. But for whatever reason, ERM frameworks embrace it. Under that conception of risk, one is forced to allow that positive risk exists to provide for positive (desirable) and negative undesirable) future outcomes of present uncertainty. To avoid confusion, the word, “positive,” in positive risk in ERM circles means desirable and beneficial, and not merely real or incontestable (as in positive proof). The concepts that positive risk jumble and confound are handled in other risk-analysis domains with due clarity. Other domains acknowledge that risk is taken, when it is taken rather than being transferred or avoided, in order to gain some reward; i. e., a risk-reward calculus exists. Since no one would take risk unless some potential for reward existed (even if merely the reward of a thrill) the concept of positive risk is held as incoherent in risk-centric fields like aerospace and nuclear engineering. Positive risk confuses cause with effect, purpose with consequence, and uncertainty with opportunity; and it makes a mess of communications with serious professionals in other fields. As evidence that only within ERM and related project-management risk tools is the concept of positive risk popular, note that the top 25 two-word strings starting with “risk” in Google’s data (e.g., aversion, mitigation, reduction, tolerance, premium, alert, exposure) all imply unwanted outcomes or expenses. Further, none of the top 10,000 collocates ending with “risk” include “positive” or similar words. While the PMI and ISO 31000 and similar frameworks promote the idea of positive risk, most of the language within their publications does not accommodate risk being desirable. That is, if risk can be positive, the frameworks would not talk mostly of risk mitigation, risk tolerance, risk-avoidance, and risk reduction – yet they do. The conventional definition of risk appearing in dictionaries for the 200 years prior to the birth of ERM, used throughout science and engineering, holds that risk is a combination of the likelihood of an unwanted occurrence and its severity. Nothing in the common and historic definition of risk disallows that taking risks can have benefits or positive results – again, the reason we take risk is to get rewards. But that isn’t positive risk. Dropping the concept of positive risk would prevent a lot of confusion, inconsistencies, and muddled thinking. It would also serve to demystify risk models built on a pretense of rigor and reeking of obscurantism, inconsistency, and deliberate vagueness masquerading as esoteric knowledge. The few simple concepts mixed up in the idea of positive risk are easily extracted. Any particular risk is the chance of a specific unwanted outcome considered in combination with the undesirability (i.e. cost or severity) of that outcome. Chance means probability or a measure of uncertainty, whether computable or not; and rational agents take risks to get rewards. The concepts are simple, clear, and useful. They’ve served to reduce the rate of fatal crashes by many orders of magnitude in the era of passenger airline flight. ERM’s track record is less impressive. When I confront chieftans of ERM with this puzzle, they invariably respond, with confidence of questionable provenance, that what works in aviation can’t work in ERM. ERM insiders maintain that risk-management disasters like AIG, Bear Stearns, Lehman Brothers, UBS, etc. stemmed from improper use of risk frameworks. The belief that ERM is a thoroughbred who’s had a recent string of bad jockeys is the stupidest possible interpretation of an endless stream of ERM failures, yet one that the authors of ISO 31000 and risk frameworks continue to deploy with straight faces. Those authors, who penned the bollixed “effect of uncertainty on objectives” definition of risk (ISO 31000 2009) threw a huge bone to big consultancies positioned to peddle such poppycock to unwary clients eager to curb operational risk. The absurdity of this broader ecosystem has been covered by many fine writers, apparently to no avail. Mlodinow’s The Drunkard’s Walk, Rosenzweig’s The Halo Effect, and Taleb’s Fooled by Randomness are excellent sources. Douglas Hubbard spells out the madness of ERM’s shallow and quirky concepts of probability and positive risk in wonderful detail in both his The Failure of Risk Management and How to Measure Anything in Cybersecurity Risk. Hubbard points out the silliness of positive risk by noting that few people would take a risk if they could get the associated reward without exposure to the risk. My greatest fear in this realm is that the consultants peddling this nonsense will infect aerospace, aviation and nuclear power as they have done in the pharmaceutical world, much of which now believes that an FMEA is risk management and that Functional Hazard Analysis is a form you complete at the beginning of a project. The notion of positive risk is certainly not the only flaw in ERM models, but chucking this half-witted concept would be a good start. McKinsey is also active in the Change Management/Leadership Management realm, which usually involves organizational, occupational and industrial psychology based on behavioral science. Like most science, all this work presumably involves a good deal of iterating over hypothesis and evidence collection, with hypotheses continually revised in light of interpretations of evidence made possible by sound use of statistics. Given that, and McKinsey’s phenomenal success at securing consulting gigs with the world’s biggest firms, you’d think McKinsey would set out spotless epistemic values. A bit has been written about McKinsey’s ability to walk proud despite questionable ethics. In his 2013 book The Firm Duff McDonald relates McKinsey’s role in creating Enron and sanctioning its accounting practices, and its 2008 endorsement of banks funding their balance sheets with debt, and its promotion of securitizing sub-prime mortgages. I’m not talking about those kinds of values. I mean epistemic and scientific values. These are focused on how we acquire knowledge and what counts as data, fact, and information. They are concerned with accuracy, clarity, falsifiability, reliability, testability, and justification – all the things that separate science from pseudoscience. Five decades of studies show Myers-Briggs to be junk due to low evidential support. Did McKinsey mis-file those reports? McKinsey’s Brussels director, Olivier Sibony, once expressed optimism about a nascent McKinsey collective decision framework, saying that while preliminary results we good, it still fell short of “a standard psychometric tool such as Myers–Briggs.” Who finds Myers-Briggs to be such a standard tool? Not psychologists or statisticians. Shouldn’t attachment to a psychological test rejected by psychologists, statisticians, and experiment designers offset – if not negate – retrospective judgments by consultancies like McKinsey (Bain is in there too) that MBTI worked for them? What has been the model’s track record at predicting the outcome of future events? How would you know if were working for you? What would count as evidence that it was not working? Does Hayes’ explanation of MBTI’s popularity (people find it useful) defend its efficacy and value in business? It’s still less popular than horoscopes, which people find useful, so should McKinsey switch to the higher standards of astrology to characterize its employees and clients? Granting Hayes, for sake of argument, that popular usage might count toward evidence of MBTI’s value (and likewise for astrology), what of his statement that MBTI never was intended to be predictive? Consider the plausibility of a model that is explanatory – perhaps merely descriptive – but not predictive. What role can such a model have in science? This question was pursued heavily by epistemologist Karl Popper (who also held a PhD in Psychology) in the mid 20th century. Most of us are at least vaguely familiar with his role in establishing scientific values. He is most famous for popularizing the notion of falsifiability. For Popper, a claim can’t be scientific if nothing can ever count as evidence against it. Popper is particularly relevant to the McKinsey/MBTI issue because he took great interest in the methods of psychology. In his youth Popper followed Freud and Adler’s psychological theories, and Einstein’s physics. Popper began to see a great contrast between Einstein’s science and that of the psychologists. Einstein made bold predictions for which experiments (e.g. Eddington’s) could be designed to show the prediction wrong if the theory were wrong. In contrast, Freud and Adler were in the business of explaining things already observed. Contemporaries of Popper, Carl Hempel in particular, also noted that explanation and prediction should be two sides of the same coin. I.e., anything that can explain a phenomenon should be able to be used to predict it. This isn’t completely uncontroversial in science; but all agree prediction and explanation are closely related. Neither Freud nor Adler excludes any particular person’s acting in any particular way, whatever the outward circumstances. Whether a man sacrificed his life to rescue a drowning child (a case of sublimation) or whether he murdered the child by drowning him (a case of repression) could not possibly be predicted or excluded by Freud’s theory; the theory was compatible with everything that could happen. (emphasis in original – Replies to My Critics, 1974). For Popper, Adler’s psychoanalytic theory was irrefutable, not because it was true, but because everything counted as evidence for it. On these grounds Popper thought pursuit of disconfirming evidence to be the primary goal of experimentation, not confirming evidence. Most hard science follows Popper on this value. A theory’s explanatory success is very little evidence of its worth. And combining Hempel with Popper yields the epistemic principle that even theories with predictive success have limited worth, unless those predictions are bold and can in principle be later found wrong. Horoscopes make countless correct predictions – like that we’ll encounter an old friend or narrowly escape an accident sometime in the indefinite future. Popper brings to mind experiences where I challenged McKinsey consultants on reconciling observed behaviors and self-reported employee preferences with predictions – oh wait, explanations – given by Myers-Briggs. The invocation of sudden strengthening of otherwise mild J (Judging) in light of certain situational factors recalls Popper’s accusing Adler of being able to explain both aggression or submission as the consequence of childhood repression. What has priority – the personality theory or the observed behavior? Behavior fitting the model confirms it; and opposite behavior is deemed acting out of character. Sleight of hand saves the theory from evidence. Many writers see Management Science as more drawn to theory and less to evidence (or counter-evidence) than is the case with the hard sciences – say, more Aristotelian and less Newtonian, more philosophical rationalism and less scientific empiricism. Allowing this possibility, let’s try to imagine what elements of Myers-Briggs theory McKinsey leaders find so compelling. The four dimensions of MBTI were, for the record, not based on evidence but on the speculation of Carl Jung. Nothing is wrong with theories based on a wild hunch, if they are born out by evidence and they withstand falsification attempts. Since this isn’t the case with Myers-Briggs, as shown by the testing mentioned above, there must be something in it that attracts consultants. Now that’s a dark assessment of humanity. And it conflicts with the last decade’s neuro- and behavioral science that McKinsey claims to have incorporated in its offerings. That science suggests our brains, our minds, and our behaviors are mutable, like our bodies. Few today doubt that personality is in some sense real, but the last few decades’ work suggest that it’s not made of concrete (for insiders, read this as Mischel having regained some ground lost to Kenrick and Funder). It suggests that who we are is somewhat situational. For thousands of years we relied on personality models that explained behaviors as consequences of personalities, which were in turn only discovered through observations of behaviors. For example, we invented types (like the 16 MBTIs) based on behaviors and preferences thought to be perfectly static. Evidence against static trait theory appears as secondary details in recent neuro- and behavioral science work. Two come to mind from the last week – Carstensen and DeLiema’s work at Stanford on the fading of positivity bias with age, and research at the Planck Institute for Human Cognitive and Brain Sciences showing the interaction of social affect, cognition and empathy. Much attention has been given to neuroplasticity in recent years. Sifting through the associated neuro-hype, we do find some clues. Meta-studies on efforts to pair personality traits with genetic markers have come up empty. Neuroscience suggests that the ancient distinction between states and traits is far more complex and fluid than Aristotle, Jung and Adler theorized them to be – without the benefit of scientific investigation, evidence, and sound data analysis. Even if the MBTI categories could map onto reality, they can’t do the work asked of them. McKinsey’s enduring reliance on MBTI has an air of folk psychology and is at odds with its claims of embracing science. This cannot be – to use a McKinsey phrase – directionally correct. If personality overwhelmingly governs behavior as McKinsey’s use of MBTI would suggest, then Change Management is futile. If personality does not own behavior, why base your customer and employee interactions on it? If immutable personalities control behavior, change is impossible. Why would anyone buy Change Management advice from a group that doesn’t believe in change? For business reasons I’ve started a separate blog – “on risk of” – for topics involving risk analysis, probability , aerospace and process engineering, and the like. Tonight I wrote a post there on logical fallacies that come up in medicine and in court. For example, confusing the probability of a match between characteristics of a perpetrator as reported by witnesses and those of a specific suspect with the probability of a match with anyone in a large population – particularly when the probability of a match is claimed by prosecution to be the probability that a defendant is not guilty. I also look at cases involving confusion between the conditional probability of A given B vs. the probability of B given A, e.g., the chance of the disease given a positive test result vs. the chance of a positive test result given the disease – classic Bayes Theorem stuff. Please join me at onriskof.com. Thanks for your interest. Fifty years ago Thomas Kuhn’s Structures of Scientific Revolution armed sociologists of science, constructionists, and truth-relativists with five decades of cliche about the political and social dimensions of theory choice and scientific progress’s inherent irrationality. Science has bias, cries the social-justice warrior. Despite actually being a scientist – or at least holding a PhD in Physics from Harvard, Kuhn isn’t well received by scientists and science writers. They generally venture into history and philosophy of science as conceived by Karl Popper, the champion of the falsification model of scientific progress. Kuhn was wrong about a great many details. Despite the exaggeration of scientific detachment by Popper and the proponents of rational-reconstruction, Kuhn’s model of scientists’ dogmatic commitment to their theories is valid only in novel cases. Even the Copernican revolution is overstated. Once the telescope was in common use and the phases of Venus were confirmed, the philosophical edifices of geocentrism crumbled rapidly in natural philosophy. As Joachim Vadianus observed, seemingly predicting the scientific revolution, sometimes experience really can be demonstrative. Kuhn seems to have cherry-picked historical cases of the gap between normal and revolutionary science. Some revolutions – DNA and the expanding universe for example – proceeded with no crisis and no battle to the death between the stalwarts and the upstarts. Kuhn’s concept of incommensurabilty also can’t withstand scrutiny. It is true that Einstein and Newton meant very different things when they used the word “mass.” But Einstein understood exactly what Newton meant by mass, because Einstein had grown up a Newtonian. And if brought forth, Newton, while he never could have conceived of Einsteinian mass, would have had no trouble understanding Einstein’s concept of mass from the perspective of general relativity, had Einstein explained it to him. Likewise, Kuhn’s language about how scientists working in different paradigms truly, not merely metaphorically, “live in different worlds” should go the way of mood rings and lava lamps. Most charitably, we might chalk this up to Kuhn’s terminological sloppiness. He uses “success terms” like “live” and “see,” where he likely means “experience visually” or “perceive.” Kuhn describes two observers, both witnessing the same phenomenon, but “one sees oxygen, where another sees dephlogisticated air” (emphasis mine). That is, Kuhn confuses the descriptions of visual experiences with the actual experiences of observation – to the delight of Steven Shapin, Bruno Latour and the cultural relativists. Finally, Kuhn’s notion that theories completely control observation is just as wrong as scientists’ belief that their experimental observations are free of theoretical influence and that their theories are independent of their values. Despite these flaws, I think Kuhn was on to something. He was right, at least partly, about the indoctrination of scientists into a paradigm discouraging skepticism about their research program. 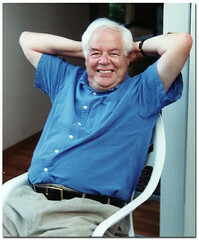 What Wolfgang Lerche of CERN called “the Stanford propaganda machine” for string theory is a great example. Kuhn was especially right in describing science education as presenting science as a cumulative enterprise, relegating failed hypotheses to the footnotes. Einstein built on Newton in the sense that he added more explanations about the same phenomena; but in no way was Newton preserved within Einstein. Failing to see an Einsteinian revolution in any sense just seems akin to a proclamation of the infallibility not of science but of scientists. I was surprised to see this attitude in Stephen Weinberg’s recent To Explain the World. Despite excellent and accessible coverage of the emergence of science, he presents a strictly cumulative model of science. While Weinberg only ever mentions Kuhn in footnotes, he seems to be denying that Kuhn was ever right about anything. This seems a very cagey way of saying that Einstein disproved Newton’s theory. Newtonian dynamics is not an approximation of general relativity, despite their making similar predictions for mid-sized objects at small relative speeds. Kuhn’s point that Einstein and Newton had fundamentally different conceptions of mass is relevant here. Newton’s explanation of his Rule III clearly stresses universality. Newton emphasized the universal applicability of his theory because he could imagine no reason for its being limited by anything in nature. Given that, Einstein should, in terms of explanatory power, be seen as overturning – not extending – Newton, despite the accuracy of Newton for worldly physics. Weinberg insists that Einstein is continuous with Newton in all respects. But when Eddington showed that light waves from distant stars bent around the sun during the eclipse of 1918, Einstein disproved Newtonian mechanics. Newton’s laws of gravitation predict that gravity would have no effect on light because photons do not have mass. When Einstein showed otherwise he disproved Newton outright, despite the retained utility of Newton for small values of v/c. This is no insult to Newton. Einstein certainly can be viewed as continuous with Newton in the sense of getting scientific work done. But Einsteinian mechanics do not extend Newton’s; they contradict them. This isn’t merely a metaphysical consideration; it has powerful explanatory consequences. In principle, Newton’s understanding of nature was wrong and it gave wrong predictions. Einstein’s appears to be wrong as well; but we don’t yet have a viable alternative. And that – retaining a known-flawed theory when nothing better is on the table – is, by the way, another thing Kuhn was right about.